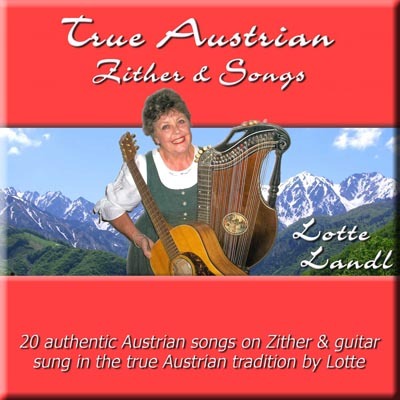 Zither Melodies by Lotte Landl - Austrian Zither and Guitar with a difference! Austrian Zither and Guitar with a difference! Click a cover icon below to jump to that album or just scroll down. Order your CDs from this website below. PayPal welcome. 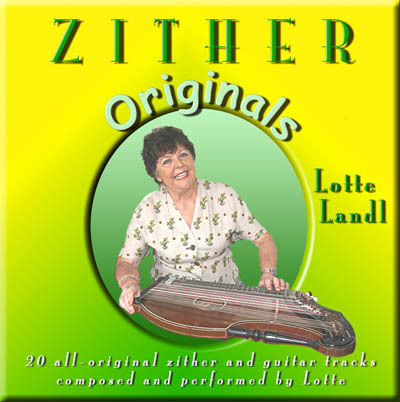 Watch Lotte perform and explain the Zither on YouTube. Listen and buy CDs direct in the U.S. from CD Baby. 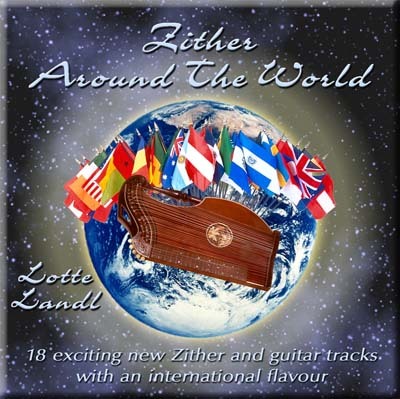 Welcome to ZitherMelodies.com and Lotte's beautiful, unique, zither melodies and old time favourites plus fresh new original tracks written by Lotte. Below you will find Lotte's latest release True Austrian, and her recent releases Zither Originals, Zither by Candlelight, Zither Dance Rhythms, Christmas Zither and Zither Around The World plus her first four CDs Zither Melodies, Snowcapped Zither Melodies, Golden Zither and Happy Mother's Day. You can purchase the CDs below using the secure e-commerce shopping cart or email Lotte for arrangements to send a cheque or bank draft. All prices in Australian dollars. Each CD has a $2 postage fee added on in the online Shopping Cart. You'll find some fascinating background information in her story on the Biography page. Hear samples from every track on iTunes. Gruess Gott meine lieben Oesterreicher and hello to all my dear Zitherfriends. This is a long overdue recording, namely ‘All Austrian’. This is the music I grew up with, they are the songs that are deep rooted. I remember the fun times when we sat for hours singing and playing and yodelling. I have chosen some of them and I am sure they will bring back happy memories to you also. Sing along. Below is a list of the album tracks including a link for a 60 second mp3 audio excerpt from True Austrian. It will open in a new window, download into your browser and play after a few seconds depending on your system. Close that new window to return here. Also listen and buy CDs direct from CD Baby in the U.S.
Click to listen, buy and download whole albums or individual tracks directly from iTunes! Hello my dear Zither friends. This time, on this CD, it is all me. My own compositions, my zither and my guitar. I have taken some of the tracks from my previous recordings and added some new ones. I am happy with the outcome of it all and I hope that you will enjoy all my 20 very individual melodies. I have had many compliments sent to me, but one in particular I would like to share is ‘Your music is beautiful. You push the boundaries of zither music which is very nice to hear’. Below is a list of the album tracks including a link for a 60 second mp3 audio excerpt from Zither Originals. It will open in a new window, download into your browser and play after a few seconds depending on your system. Close that new window to return here. Grab a glass of red! 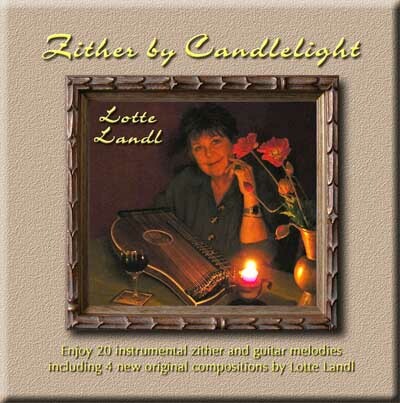 Relax and dream along to my Zither by Candlelight selection of wonderful old melodies that create a ‘candlelight with a glass of wine in hand’ atmosphere. I have included 4 new tracks of my own composition and I hope you will enjoy them also. Take your partners and step in time. Dancing is fun. 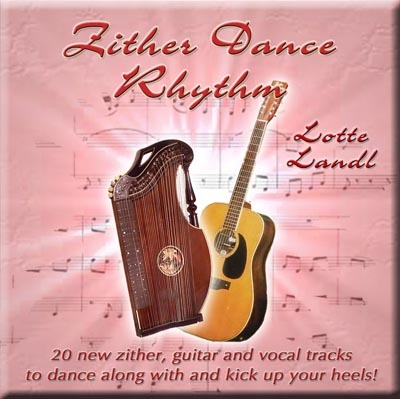 On Zither Dance Rhythm I have again a selection of English and German songs. Some slow, some more invigorating. Dancing is the most wonderful way of expressing our own physical emotions. It is fun watching people dance, it is actually very interesting. Join in and enjoy. Christmas is a happy, peaceful and joyous time. On Christmas Zither I have a mixture of everything. Some English, some German. Three of my own compositions. Having grown up in the ‘cold winter days’ I remember so well the snowflakes on my window, or the birdies looking for food in the snow, and skating on frozen over ponds, oh- and the wild toboggan rides. Oh what fun! Below is a list of the album tracks including a link for a 60 second mp3 audio excerpt from Christmas Zither . It will open in a new window, download into your browser and play after a few seconds depending on your system. Close that new window to return here. "Travelling the world in my imagination while recording this new album was a lot of fun. Come with me now and enjoy the traditional music I love from countries around the world. Here is a chance for us to dream of distant places, kicking up our heels to dance and sing along." Below is a list of the album tracks including a link for a 60 second mp3 audio excerpt from Zither Around The World . It will open in a new window, download into your browser and play after a few seconds depending on your system. Close that new window to return here. 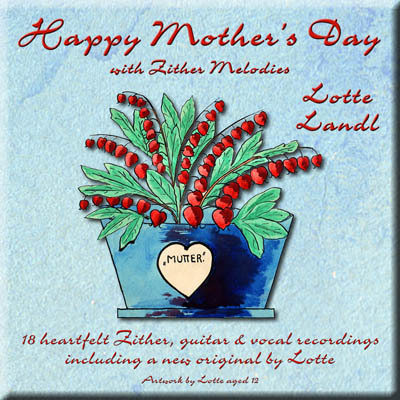 Happy Mother's Day has 18 heartfelt Zither, guitar and vocal recordings which includes a new original composition written by Lotte especially for Mother. ‘Sit back and relax’ is the motto to my Mother’s Day recording. I didn’t go overboard with all Mama songs but picked a few old melodies that we never hear anymore. Some sung in German, some in English. My own fun composition ‘Mama in the kitchen’ sounds just like Mama chopping away and hammering the schnitzel - guten appetit! Below is a list of the album tracks including a link for a 60 second mp3 audio excerpt from Happy Mother's Day . It will open in a new window, download into your browser and play after a few seconds depending on your system. Close that new window to return here. Golden Zither will bring back happy and nostalgic memories to many of my listeners, as it has to me. Being a pure bred Austrian, I have included some of our good old Austrian melodies and selected pieces I just love to hear and play. 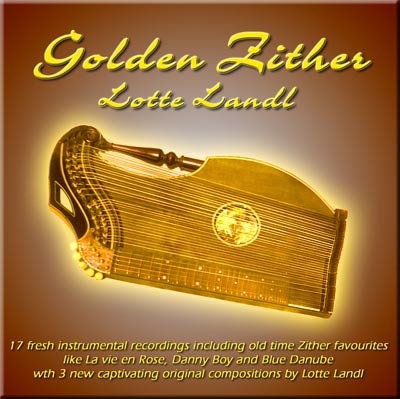 On Golden Zither you will dream too about charming Vienna, enjoy beautiful old melodies, well known folk songs and wonderful snippets from around the world. Below is a list of the album tracks including a link for a 60 second mp3 audio excerpt from Golden Zither. It will open in a new window, download into your browser and play after a few seconds depending on your system. Close that new window to return here. 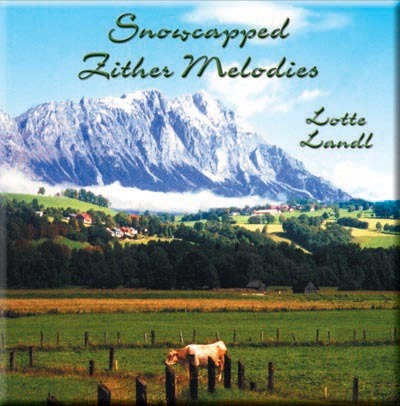 The other compilation Snowcapped Zither Melodies has zither and guitar instrumentals tracks plus zither and guitar with singing. It has more presence with lots of old favourites to sing along with. Below is a list of the album tracks including a link for a 60 second mp3 audio excerpt from Snowcapped Zither Melodies. It will open in a new window, download into your browser and play after a few seconds depending on your system. Close that new window to return here. The first two lovely compilations Zither Melodies, Snowcapped Zither Melodies were selected from her three earlier recordings The Zither, the Guitar and Me - Volumes 1, 2 & 3 previously only on audio cassette. 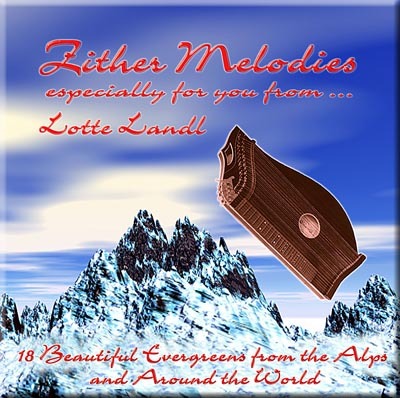 The first CD compilation Zither Melodies is a lovely selection of Lotte's more dreamy instrumental tracks which create a soothing atmosphere for quiet reflection. 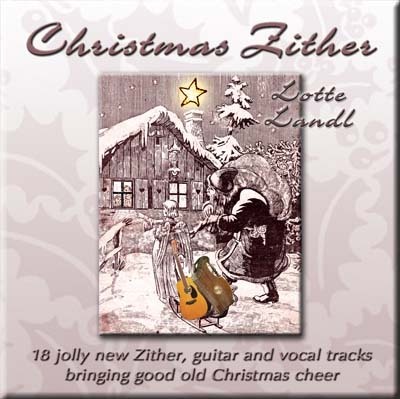 Zither Melodies also includes three brand new zither tracks written specially by Lotte. Below is a list of the album tracks including a link for a 60 second mp3 audio excerpt from Zither Melodies. It will open in a new window, download into your browser and play after a few seconds depending on your system. Close that new window to return here.